It took me a while to get into Football Manager 2014 this year, but once I did, everything fell into place. I think part of the problem was that this year the game is perhaps lacking the one stand out feature that is an easy focal point of the game. Recent seasons have seen additions like Dynamic League Reputation, the ability to add and remove leagues during a saved game and of course we saw the release last year of the Classic mode. I knew there had been some major changes to tactics and that training had been improved once again, but rather than adapt to these changes, I kept on playing the game exactly how I did last year. My tactics weren’t working and everything felt a bit samey. The match engine looks better than ever. To try and shake the feeling of déjà vu away I sprang myself into starting a Classic season game with FC Basel in the Swiss league with the ultimate aim of seeing if I could enter the Liechtensteiner Cup and triumph. I felt happy and more content with what I saw in the Classic mode than I did last year. It felt more rounded, while certainly not offering the depth of the main Career mode; it didn’t feel quite as lightweight as I found it to be last year. I made use of the ‘live’ transfer negotiations which have taken a lead from the back and forth style to contract signings to sign one or two players, threw them onto the pitch and promptly watched a few so-so performances. I really wasn’t making much use of the improved tactics module, though I did appreciate some pre-match touches such as showing a mocked up match day ticket. 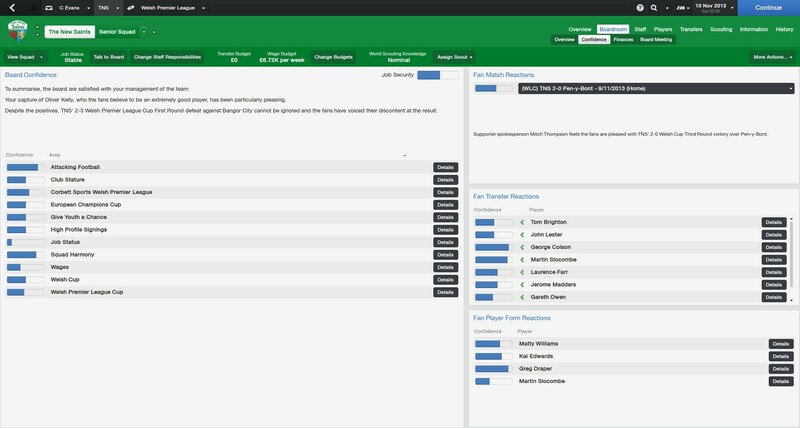 Away from the pre-season games I was in all honesty finding myself swamped with people making bids for my players, it seemed to be a constant war of rejecting bids for the same players from the same clubs over and over. I probably would have continued with the Classic mode until the Liechtensteiner Cup if it wasn’t for the game freezing at half-time during a match. The game has been heavily updated since then (that was in the first week of having my review code) so hopefully any major bugs like that have been squished, but I did annoyingly receive a random crash when trying to view a coach report of one of my players this past weekend. The world news has a fresh look, in your own inbox messages are colour coded. After that quick test of Classic mode I returned to the fully fleshed Career mode and my long-standing team of choice, The New Saints in the Welsh Premier League. I decided to take a greater look at the game this time around and see what the new features were like. The overriding vibe of this year’s release is that interaction with everything from the press to your board has been improved and the interface is much more streamlined. This is perhaps most obvious with press conferences, although at times the questions are the same as ever. No longer do you have to decide whether to attend or not before getting whisked away to a new screen for the actually Q&A, now it all takes place from the message you receive. When you sign a player you are able to ask your captain, right from the inbox, to introduce your new signing to the rest of the team. If one of your coaches has some specific feedback on how someone is performing in training, you can alter their focus there and then. Your head scout will give you a scouting report of your next opponents with some nice graphical representations of their statistics and the chance to set your training focus in the same message. These tweaks might appear to be minor, but they make the experience of playing the game that much more satisfying. The board are fairly happy with me at this point. The finances aren’t great though. I now feel confident that when I speak to my team directly outside of a match, the topics of conversation will be useful and the reaction of the players is displayed in an efficient manner. I haven’t talked to the board as much as I would if I was playing over a longer period of time, but I do feel this interaction is better with a wider variety of responses on hand to try and get your own way. I certainly like the ability to set your ethos for how the club will develop and see how the board rate your performance against those philosophies, be they playing attacking football or developing youth. As it can be so easy to settle into the groove with a game like this, you sometimes take things for granted and don’t appreciate the changes. The factors that I have just talked about sound small, but when you put them together they come to create a game which feels more modern and realistic. Take the post-match reports where there is a lovely little breakdown of possession and shots with little coloured pie-charts, simple but effective. Yes, I have been involved in the training this season. The aspect of the game which I feel has come along the most is the training module. For years there have been changes to training, but they have largely passed me by as the screens have constantly overwhelmed me. It has been all too easy to duck the staff responsibility for training and leave it to your assistant manager, My first visit to the training this season though was a positive experience, I didn’t find myself running away scared. Finally I felt like I could start to mould my players into the footballers I wanted them to be. 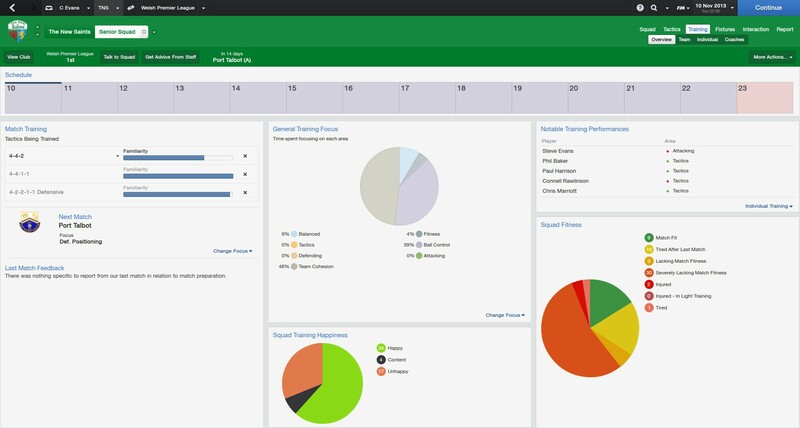 One screen provides an overall view at the training situation at your club with some very effective pie-charts indicating how much of your team is match fit and who is struggling with their workload. Another screen provides you with a view at the month ahead where you can tweak the focus of the squad’s general training at a glance. 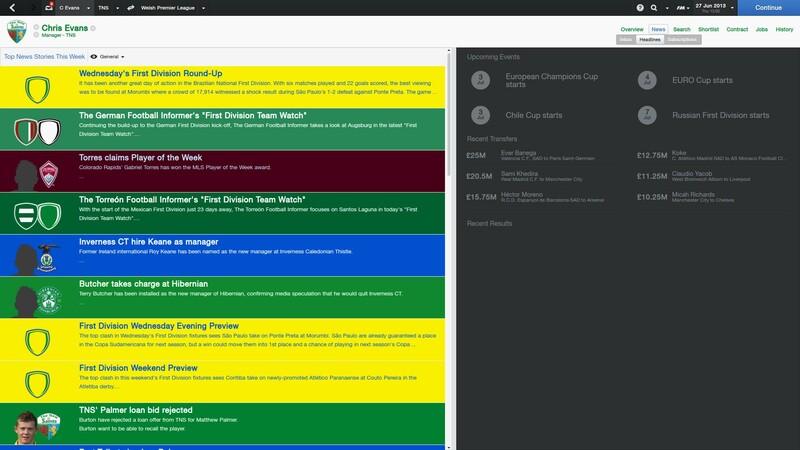 The final important screen here lets you set up individual training plans for all your players at a glance. Ease of use is key, and Sports Interactive have nailed it this time. There are loads of options to explore with your tactics. 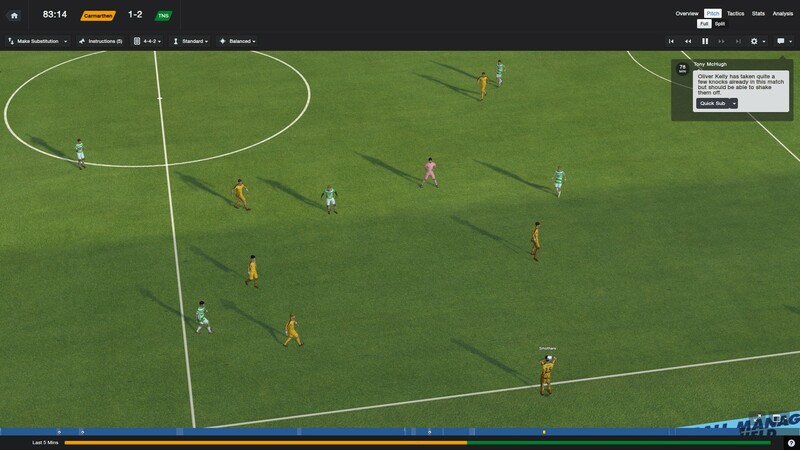 It is when you get involved in the tactics that you really appreciate how the game – both the sport of football and Football Manager – has changed over the recent years. You might set your team out in an old school 4-4-2, but when you take a look at the various roles a player can perform in that position you have to sit back and start to really think things through. Do you want to play with a False 9 or are you going with a classic lower-league big-man-little-man combination? Are your guys in the AM L/R positions going to be wingers who get to the by-line to send in a cross, or are they going to cut in on their other foot and cause havoc all on their own in the box. The options are endless, and while it took me some time to get used to the team instructions, these are now more relevant to the modern game. When it came to writing this Verdict I wasn’t sure whether I was going to approach it by telling a story of what I had achieved with my TNS squad or by doing what I did and talking about the various parts of the game which have caught my eye. I chose the latter approach because I can fully understand why people might be hesitant to fork out another wad of cash of a new iteration which lacks one big stand-out new feature. 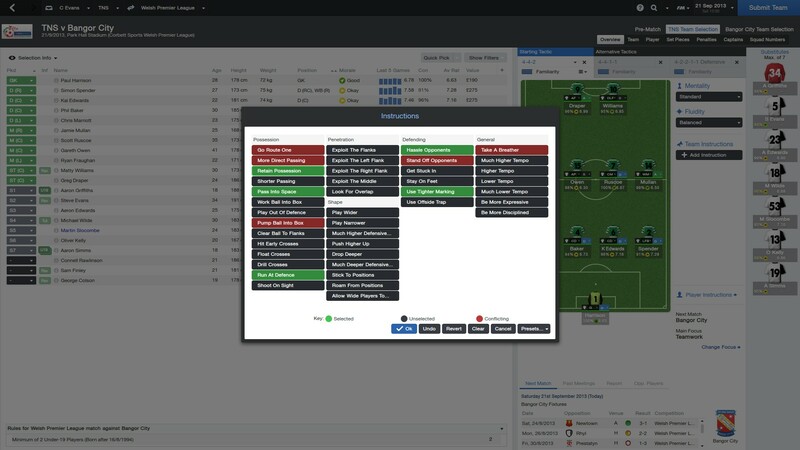 What I have found though with Football Manager 2014 is that it feels more relevant to what the game of football is like these days and the streamlined nature of the interface allows you to get on with the game without getting lost in a multitude of menus. I’m sure I will have some time to tell my tales in upcoming editions of Our Week in Games though. Review based on Steam code supplied by PR. For more on our scoring policy please read this article.